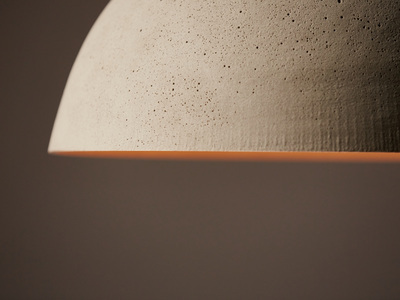 Fly Light - MJP Studio - Furniture. Object. Design. Made. 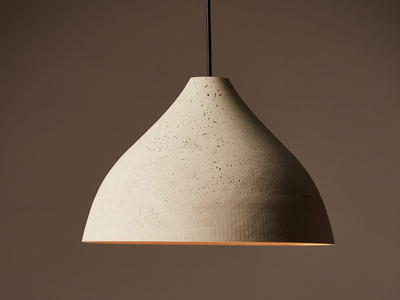 The Fly Light pendant is a lightweight shade made from a fly ash resin composite. Fly ash is generated by coal combustion and is a major by-product of the coal industry that generally ends up as waste. The Fly Light shades contains up to 50% of fly ash within the resin mix, enabling an incredibly light and thin shade that can hang only using the power cord. Due to the nature of the material and casting process, every Fly Light pendant will be unique from the next one. This may include more/less bubbles and bubbles of varying sizes and shapes.